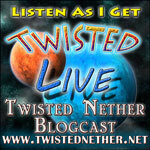 For reasons that are still a mystery to me, the fine crew at the Twisted Nether blogcast have invited for a chat this coming Saturday. To say I was surprised is putting it mildly but I wouldn’t miss it for the world. Still, doing an interview in English when my first language is French is a bit terrorizing but I’m confident I’ll manage. If anything the Effers have all said I’m doing great. So if you want to pop in to say or just to mess with me, feel free to this Saturday at 11pm EST (or round 11:15 I’ve been told). Est ti, tabernaque. Poutine! Fromage! Samuel de Champlain! If your spoken word is anything near as good as your written word, you’ll be fine. Have fun and bon(ne?) chance! I’ll be drunk, I’ll try to listen to it later when they put it up . My French is only very basic, but if you get bored during the show, we can drive the chat room insane in French. Je vais te voir samedi! I’ll be sure to listen to it! I won’t be able to hear it live, but I look forward to hearing it when they put it up!